The historical list of meet champions may look rather lopsided, but last year's boys team championship was decided by just two points. The 2017 Consortia Championship will be just as hotly contested. 50% of Consortia coaches polled predicted that Northwood would win the boys team title and 50% of Consortia coaches predicted that it would once again be Einstein. Einstein head coach, Eric DaSilva, added a third and fourth alternative. He commented that the boys team race will be a battle with Northwood, Einstein, and Paint Branch with Blair lurking. What does recent history tell us in terms of recent matchups? Very little. There has been surprisingly little crossover among Consortia teams in the first six weeks of the season. Paint Branch and Einstein were in the same MCPS division. Einstein beat Paint Branch in their only meeting, but the Panthers showed DaSilva enough to be on high alert. Northwood has had no meetings with either Einstein or Paint Branch this season. 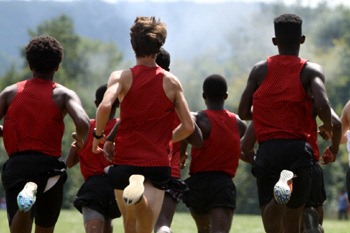 Northwood has not raced very much in general, but they showed at the Spiked Shoe Invitational that their boys team has five quality runners including the defending Consortia Champion, Obsaa Feda. The intrigue and mystery of the boys race is at an all-time high for one primary reason: nobody is quite sure just how good the Gladiators are. Most coaches believe that the girls race will not have nearly the drama of the boys race. The majority of coaches (75%) predicted that Blair would win the girls team title for the seventh time in nine years. In Mocorunning's view, there should be no dissenters. Blair's girls team should approach last year's point total of 21 points. Both male and female defending champions are back and they are having great seasons, but neither is guaranteed an easy win. 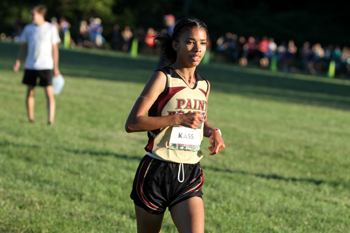 Paint Branch's Yasmine Kass will likely be challenged by Blair's Morgan Casey. Northwood's Obsaa Feda will try to shake off Einstein's trio of Simeon Mussie, Noah Clifford, and Tyler Wilson. 100% of coaches polled believe that Obsaa Feda will defend his title while 75% of coaches predicted that Yasmine Kass will repeat her title. One coach had an alternative view that Northwood's Madison Armonda would win the individual title at home. Looks like rain this year. About time.